Brad Inman has been placed on the transfer list. Peterborough United have transfer listed midfielder Brad Inman after just 12 months at the club. Experienced right-back Michael Smith, striker Shaquile Coulthirst and midfielder Adil Nabi have also been placed on the list. Posh right-back Michael Smith has been transfer-listed. In line with club policy Posh have also transfer listed star men Michael Bostwick and Marcus Maddison as they have yet to agree a new deal as they enter the final year of their existing contract. Strikers Lee Angol and Luke James, full-backs Hayden White and Jerome Binnom-Williams have also been listed as a result of this club rule. Inman was a priority target for Posh manager Grant McCann last summer when he signed from Crewe. The 25 year-old broke his leg in a pre-season training accident, but has struggled to make an impact after returning to full fitness. Inman started just five Posh matches. Smith, who made his international debut for Northern Ireland in the 2015-16 season, has made 133 appearances for Posh following his arrival from Bristol Rovers in the summer of 2014. Posh chairman Darragh MacAnthony has revealed contract talks are ongoing with Maddison and Bostwick and that he ‘lives in hope’ that they will sign, but he’s relaxed about keeping Maddison for another year if they don’t receive an acceptable bid. Mark Tyler hasn’t received a new playing contract and will concentrate on coaching the Posh goalkeepers. Striker Craig Mackail-Smith and goalkeeper Luke McGee have returned to their parent clubs. Transfer listed (4): Shaquile Coulhirst, Brad Inman, Adil Nabi, Michael Smith. 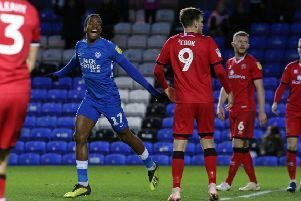 Transfer listed as entering last year of contract (7): Lee Angol, Jerome Binnom-Williams, Michael Bostwick, Luke James, Marcus Maddison, Jordan Nicholson, Hayden White. Retained (17): Chris Forrester, Jack Baldwin, Tom Nichols, Andrew Hughes, Ryan Tafazolli, Lewis Freestone, Gwion Edwards, Leo Da Silva Lopes, Jermaine Anderson, Junior Morias, Anthony Grant, Callum Chettle, Morgan Penfold, Andrea Borg, Mathew Stevens, Harry Anderson, Dion-Curtis Henry.